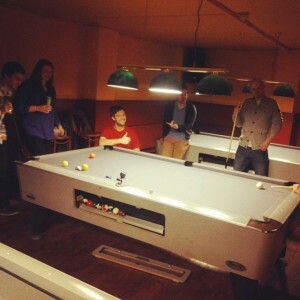 Best BYOB Pool Hall – By Totally Dublin! 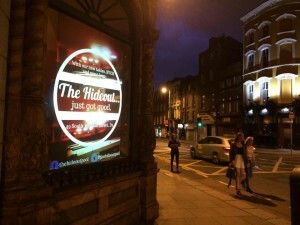 If you’d like to sample The Hideout’s new vibe tonight you can secure a table by booking online. Our new screen based poster outside Avalon House, Aungier Street! Masters in Business students from Trinity College Dublin headed down to The Hideout for cans and pool to celebrate the end of their exams. We’re currently offering free BYOB for students, and the group took full advantage, enjoying some melodic deep house and hours of competitive pool, and substantial quantities of beer! Take a look at the video below. PS. Any ideas you’ve got to help make The Hideout the best pool hall in Dublin, please comment below. Thanks guys! Why BYOB At The Hideout Pool Hall? We all love our city, but one of the lesser liked facets of Dublin is that is boasts one of the priciest pints in the whole world. Yep, a fairly conservative government and profiteering retailers have sent the price of a pint skyrocketing over the last few years. So until Wetherspoon’s arrives in town what can we do about it? Well, initially we had a few doubts about going BYOB; we thought about the cans and more specifically the consumption of warm beer, a fate worse than no beer at all! Even so, we weren’t going to get a licence any-time soon, so how could we improve on it? Well we’ve now got in a load of fridges in, so there’s no issue with the cold beer any-more at least, we’ve not put on draconian limits that make you feel like an untrustworthy teenager, and we’ve not stuck on an extortionate price for the pleasure of drinking your own alcohol! Our BYOB is €5 per person. Pool and beer is the dream, and officially back in Dublin. Come and give it a go You can book a table and enjoy BYOB any day past 6pm or all day on the weekends. Enjoy. 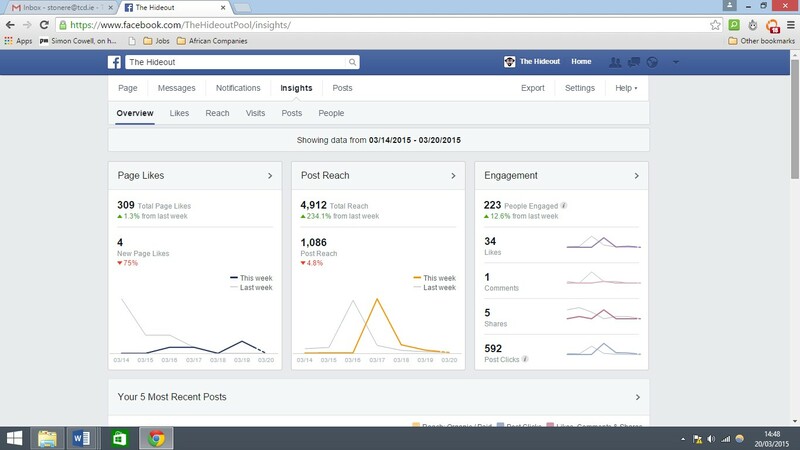 3 weeks ago we decided to try and boost our social media presence by offering a free game of pool for a Facebook check in. Thanks to all of you who participated, we’ve just got our 100th check in! We want to be the best place in Dublin for you to relax and have a few beers – that’s why we’ve invested in our pool hall, and are willing to give you a discount for helping us spread the word. Recently, we decided to give our epic old pool hall a bit of what our interior designer calls “hair and make up.” In reality, we got a bit carried away and ended up with a complete makeover. Gone is the glass box that had the tendency to hide away our staff replaced by a nice welcoming bar for you all! Gone are the overly dark walls. Gone are the old school green baizes . Here at The Hideout, we have always been a champion of British pool. There’s just something about the green baize, the small pockets and the intricate challenge of negotiating a small table rammed with red and yellow balls. But from next week onwards, we are delighted to be able to offer you the opportunity of also playing on 3 8×5 American pool tables. We’ve listened to some of you guys who prefer the American tables and are happy to now offer you this faster paced version of the game. As well as playing 8 ball on bigger tables, with bigger pockets, those of you who back yourselves as great players can now take on 9 ball at The Hideout! The goal of 9 ball pool is to pot the balls 1-9 in order. Its harsh. You can pot the previous 8 balls, but if your opponent pots the black then you also lose! Since the Mosconi Cup has begun to be aired on Sky Sports, this version of the game has been more and more popular across the pond, and we believe it will really take off here in Ireland! Our aim is to be the best pool hall in Dublin. We have the city centre location, have got top quality British pool tables, and now have American pool tables too. I very much hope that you enjoy playing on them! The cost will be €5 per person, making us the cheapest and the best pool hall in Dublin city centre! 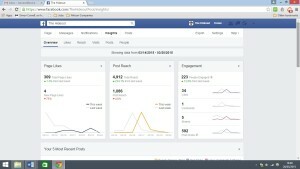 We’d love to hear your views, so do get in touch with us on facebook or twitter. PS. You can book your table now, for that chilled session of beer and pool here.